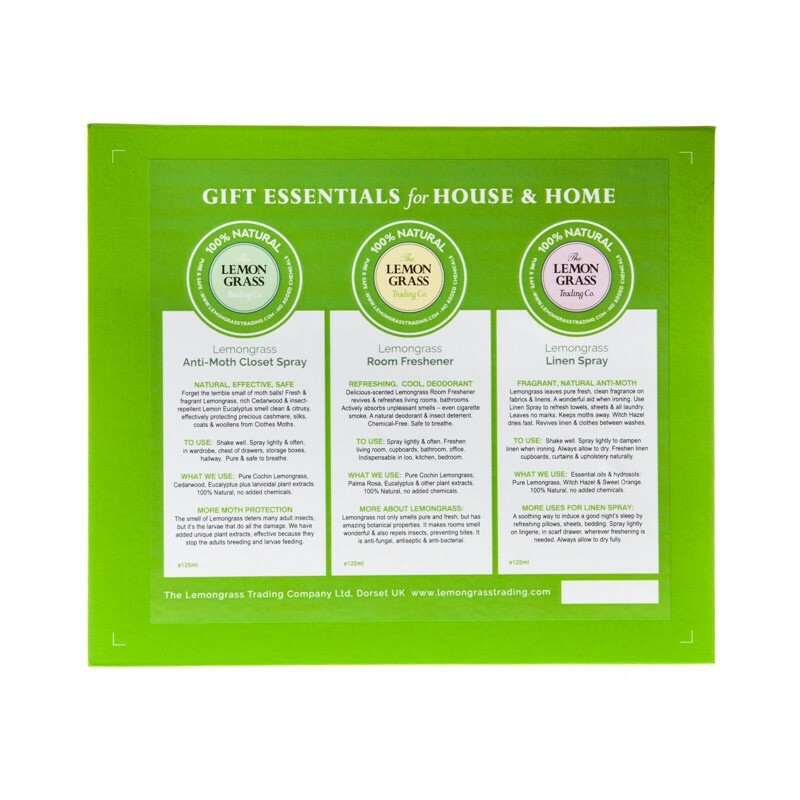 A brilliant new Gift idea: this beautiful Box contains 3 Lemongrass Sprays to bring fragrance and delight to every House & Home. All-natural Anti-Moth protection with Cedarwood; Room Freshener to deodorise and refresh; Linen Spray with Sweet Orange to take the chore out of ironing. This Anti-Moth Lemongrass & Cedarwood Repellent Spray is an effective and all-natural moth repellent spray for wardrobe or drawers. Laboratory tested and handmade in the UK, the spray contains no added chemicals, making it safe to breathe in bedroom or closet – unlike so many other harsh chemical-laden insecticides. Made from Lemongrass, Cedarwood & Neem. our brilliant new addition, which stops moth larvae from feeding – which is what causes all the damage to precious cashmeres, expensive suits, silks, lingerie and woollens. This is our all-time best-seller, as we wage war on those terrible destructive moths. 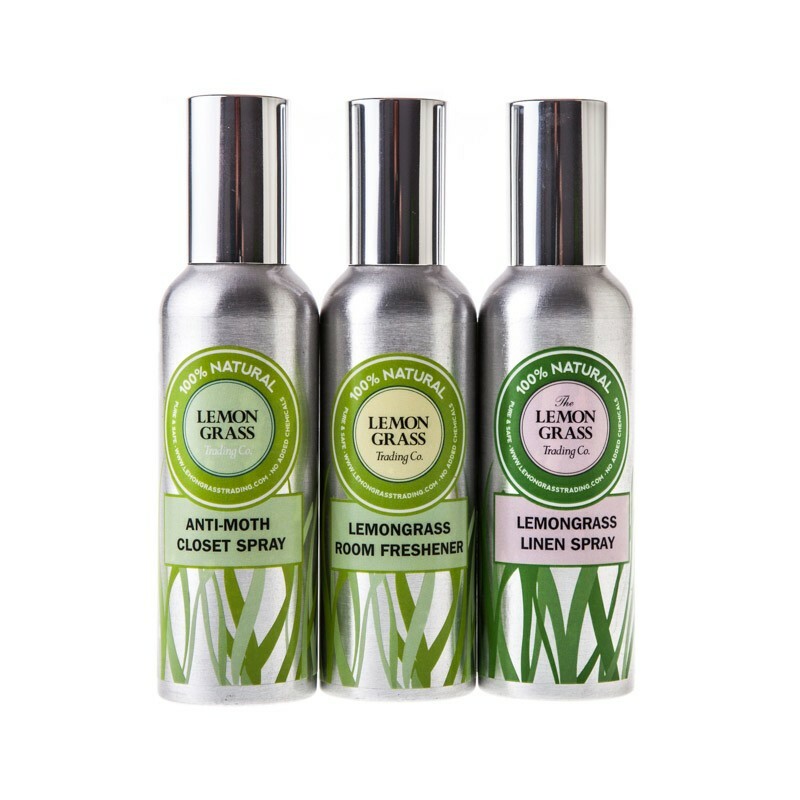 Lemongrass’s delicious fragrance is naturally deodorant, safe to breathe and keeps away insects. This 100% natural and pure Lemongrass Room Freshener is safe, green and eco-friendly. Uplifts the spirits, smells delicious, and is an active natural deodorant, absorbing unpleasant smells. Indispensable in bedroom, bathroom, loo and kitchen, it is even safe on food). Brilliant for removing lingering pet smells – even cigarette smoke. Family & pet-safe. Lemongrass & Sweet Orange Linen Spray’s wonderful fragrance will take the burden out of ironing! Ideal to dampen linen as you iron, or to freshen upholstery, bedding and towels. Spray cashmere & woollens to help deter moths. Take some of the burden out of ironing! Smelling utterly delicious, it can be used to dampen dry sheets & clothes before ironing, or to freshen bedding, curtains & upholstery. A light spritz on your pillow is a brilliant aid to sleep. Always allow to air dry. ORDER NOW and we’ll post your Gift Boxes direct to any address in the UK. We’ll also enclose a Gift Card.Let us take the strain! anti-fungal, naturally deodorant & a natural insecticide – Ideal for original, safe and deliciously fragrant gifts. All our products are chemical-free, safe to breathe. Effective. Laboratory-tested. Made in Dorset. Free postage and packaging within the U.K. If you would like your Gift Box to be mailed outside the UK, please Contact Us for a delivery quote.